Would you like to learn the skills to save someone’s life in only one day? The Student Recreation Center is offering classes throughout the semester to get you CPR, AED and First Aid certified. For just $52 per person, you’ll gain hands-on training that will prepare you for a variety of cardiac, breathing and first aid emergencies. For just $52 per person, you’ll gain hands-on training that will prepare you for a variety of emergency situations. 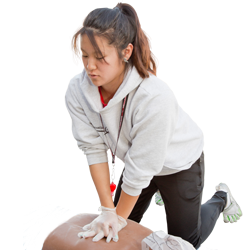 The purpose of the American Red Cross CPR, AED and First Aid Training program is to help you learn how to recognize and respond appropriately to cardiac, breathing and first aid emergencies. The courses in this program teach skills that you need to know to provide immediate care to a suddenly injured or ill person until more advanced medical personnel arrive and take over. Sign up at the SRC front desk or online. All CPR, AED and First Aid certifications are valid for 2 years from the date of your course completion. For more information, contact Ryan Hairapetian at 818-677-5804.